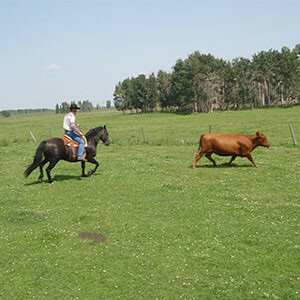 Canadian Hay Ranch is a family owned ranch nestled in the rolling hills of Alberta, outside Cremona. We have a team of 4 people who all work hard to raise the best horses for future buyers. Earl Blain is the owner and is always upbeat and makes sure everything is running smoothly around the ranch. Earl tries to find the perfect fit to ensure the best outcome for horse and owner when selling horses. 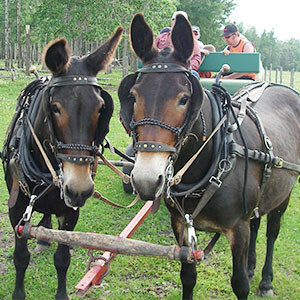 A horse viewing can be scheduled just about any day of the week. Our driving trainer, George has been with us for many years and all the horses he has worked with have become very quiet, easy to handle and easy to drive or ride. Our two lovely girls help around the ranch, and have taken lessons at River´s Edge Camp from which the horses here are benefiting. 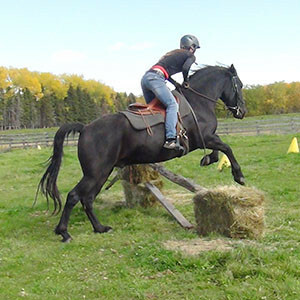 Paige has 8 years of experience around horses, starting at age 11 with a wildie mare. Someone is always at the ranch, however please call and book an appointment if you wish to come see our horses and we can ensure someone will be here to help you find your perfect steed. We always look forward to meeting new people, and have an open spot for a good horse trainer and rider. 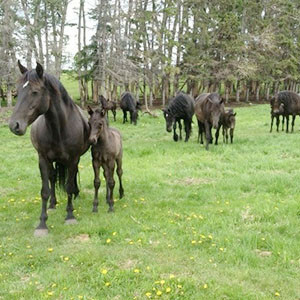 Canadian Hay Ranch has a stunning herd of purebred Canadian broodmares, a few trained to ride and all are very calm and approachable. These specially picked mares are mostly all black, with good confirmation and willing temperaments and don't forget the pedigrees! They are bred, and kept with the stallion that not only compliments the mares' confirmation, but also minimizes any chance of inbreeding. Our lovely stallions are all very people orientated and well-trained even including attending spruce meadow shows. We kept the best broodmares and picked good-looking stallions to produce something everyone will like. 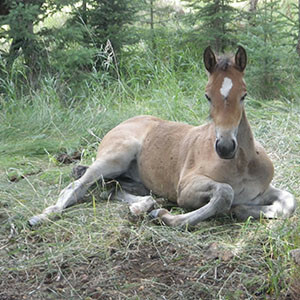 Our foals are handled young, after a few weeks with their mother to ensure a good upbringing. They learn to be a confident, calm and curious horse from their mother, playing with other foals and being in a herd environment. They have a wonderful beginning to life on 40 acres of grass to run around with their siblings. Once the foals have a few weeks to be horses we start bringing them in and they sure do come around fast! Canadians prove to be very willing, quick learners who look to please. 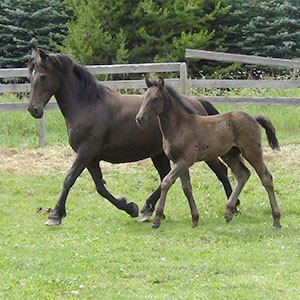 We scratch, pick up hooves and start to desensitize the foals, but don't usually halterbreak till they are about 6-8 months old after weaning. This gives them more time to grow and develop and gives the brain more maturity. Once the weanlings are halterbroke, calm and easy to catch they will be put out onto pasture again. They are handled bi-weekly after that with basic training so once they are three years old, some will be started into a little heavier work. Our horses are started under western saddle, but are easy to train for english. We have had many different people purchase horses for all kinds of their needs. Some horses we breed have beautiful movement making them excellent candidates for dressage. Others are bought and used by children for jumping or other activities like gymkhana. Their hardy hooves and big muscular bodies are suited perfectly for the hardest of trail rides. With our stallion we have claimed blue ribbons and prizes in shows such as double driving at spruce meadows just to prove they are worth their weight in gold. Give us a call or email as we would love for you to come out and see the horses. I am sure the young horses will steal your heart! We can almost guarantee you will find a horse that will suit you and your needs if the horse doesn't pick you first!